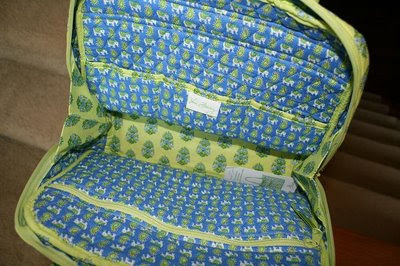 Buford Betty: Vera Bradley Giveaway! OK so I let my official 2-year bloggaversary pass by this month without any recognition. So while this is a little tardy, Happy Bloggaversary to me!!! And in celebration, I'm doing a fun little giveaway... so get excited! 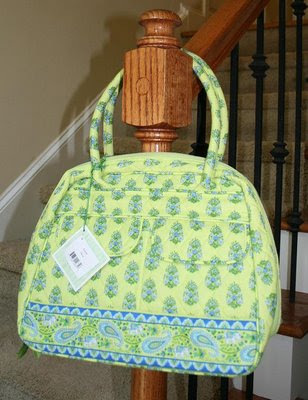 Up for grabs is this fabulous Bowler bag from Vera Bradley in Citrus. 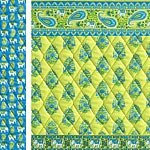 Citrus is now retired, but it's an uber fun summery pattern with some cool blues and lime green. The interior pattern is a super cute blue paisley with elephants. The Bowler is one of my very favorite styles... I have several bowlers in different fabrics. It's a great bag because it holds deceivingly more than you think it can. It has a million little pockets and zipper hideaways - love it! Plus it opens up very wide so you can SEE what's in there (always one of my issues as I like to carry my entire life in my bags). 1. Leave a comment on this post, you get one entry. 2. Become a follower (or tell me if you already are), you get a second entry. 3. Become a follower (or tell me if you already are) over at my other fab site, Make Room for Style, you get TWO more entries! Shazam! 4. Post about this giveaway on your own blog, another two entries. 5. Finally, if you're feeling a little crazy... in honor of the late pop legend, please give me your favorite Michael Jackson memory! Mine would be sitting on the lawn at Fulton Co. Stadium for his Thriller tour. (I had a huge thing for MJ when I was a kid... oh man... that Thriller LP with the white tiger photo? Yeah.) So give me yours, that's one more entry. If I'm counting right, that's a total of 8 chances to win, girls! Super fun. OK y'all have till Friday, July 3rd at 5pm to get those entries in. Good luck!!! Happy Bloggerversary to you and many many more. Lets see on the comment section. I qualify for the comment as one. I am a follower for another. The third comment is my favorite Michael Jackson song this will be tough since I love most of them....."Don't stop till you get enough!" Oh my gosh -- where was your other blog when I was pregnant! I love the outfit ideas... I could have used some creative inspiration. I follow both blogs in Google Reader and my fav memory is when Jennifer Garner did the Thriller dance in 13 Going on 30. Cute! Please enter me twice - I'm a follower. This is one of my FAVORITE patterns! I have a different bag, the wallet, and checkbook cover...so clearly I need this! I had a sleepover at my friend Danielle's house, and we woke up the next day JUST to watch the premiere of the Black or White video! Oh this is so fun! I'm a follower both here and at Make Room for Style! (Is follower the same thing as subscribing to you on Google Reader? I'm assuming so, that's what I do...) I'll give you a shout out over on my blog in a second too. Favorite Michael Jackson memory?? Hmm...never been to a concert, honestly, it's probably some home dance parties to "ABC, 123" that's a jam and a great one to dance to! Love Vera Bradley. Hubby knows that I will pull him into a store just to look if we pass one. I am a follower of both of your blogs. As for the memory of Michael Jackson, I will show my age when I remember being a freshman in college when Thriller really became a big hit and that would be the album playing on Friday afternoons when people were getting ready to go out for the night or the weekend. This is my mom's favorite pattern and I'd love to win it for her! I'm also a follower. how do i post about your giveaway on my blog? Thanks, Bridget! You can just do a quick post with the link or put a link on your sidebar to my giveaway post. Easy peasy! I'm a follower of your site! I'm blogging this giveaway: http://treasuredgiveaways.blogspot.com/2009/06/vera-bradley.html Thanks for the chance! I love, love, love Vera Bradley! And, MJ memory...well, I love that movie "13 going on 30" when they dance to Thriller :P But, I have to say I was born in 1981 & grew up listening to Celine Dion & Mariah Carey, but I do love MJ's music! Adorable bag! Love the pattern! I just joined as a follower. What a CUTE blog! 2. I now follow this blog. 3. I follow Make room for style. BTW, I have a diaper giveaway going on at my blog until the 1st, head on over and enter to win a CASE of diapers! What a cute bag and i'm already a follower. My sister in law is a HUGE VB fan and her bday is right around the corner...this would solve my dilemma of what to get her! So! Here's my comment, I am now a follower of BOTH you blogs...woo hoo!! And my fave MJ moment would have to be the time I was in a car with my two of my guy friends. Thriller comes on the radio, I think nothing of it, then all of sudden the two of them in the front seat start doing this crazy rendition of the thriller dance. Every time I hear that song now, that's what I think of. Boys are silly. My favorite memory of MJ would definitely be my first summer at sleep away camp having my counselor dress up as MJ and do the moon walk at a late night "fairy party" where the wake all the campers up in the middle of the night and let us have juice and cookies and candy then put us back to sleep and tell us we dreamed all up when we discuss it the next morning. MJ moment is when Thriller came out. Thanks for the contest...Hope I win! Happy Bloggaversary, cute purse, count me in! Thank you for the giveaway! I am a follower of both sites and my fave MJ memory is being in elementary school when Thriller came out and jamming to that (as much as a 2nd grader can) at recess with one of those big boom boxes. Fun times! Michael Jackson was born in 1958, as I was also. My fondest memory was when the song ABC came out, the 1 song after another were hits. I loved all those early on songs of my childhood growing up in Fontana, CA along time ago. Thanks for hosting this fab giveaway! 5. My favorite Michael Jackson memory would have to when the video/short film for Thriller came out. I think I was about 5 and my mom didn't want me watching it and I couldn't get enough of it, even though it used to scare me. To me, this is still the best music video ever made. Oh! I love that bowler bag! Cute cute! You know how I love the bowler!!! :) I believe I am already following, if not, I will click to do that next. Fav Michael memory...probably trying to learn how to moonwalk with my elementary school girlfriends...wearing one of those Michael Jackson style jackets...and of course trying to learn the dance routine on Thriller. He was one of my first "crushes"! I love both blogs and I'm a follwer of both. Count me in I love this bag! Super cute - LOVE the pattern and I am not a follower! I am a follower and I love Vera!! Maybe this isn't my favorite memory but its too funny to not share, when I was little I was so scared of the Thriller video and my cousin would torture me with it, one time I locked myself in her closet because of it. Hehe, its funny now but it sure wasn't then! I am a follower of both blogs and my favorite MJ memory is from 13 going on 30 when they dance to Thriller at the party. I love that! I am so excited! Who doesn't LOVE giveaways?! I am a follower of both of your blogs and posted a little something in my sidebar about your giveaway. My favorite MJ memory is watching home videos of my hubby and his 2 cousins dance around to Beat It and Bad! They learned some killer moves from him! Yeah, I hope you draw my name! I LOVE this bag! So chic! I became a follower of this blog! I became a follower of your other blog! Such cute ideas! I became a follower of both blogs! Favorite Michael Jackson memory would have to be a fabulous mix we danced to in drill team- football season 1997! Awww- the memories! So cute! Ia ma new follower too! My fav MJ memory is dancing to "Billy Jean" at my prom. How fun those songs are to dance too. Happy 2nd Blog Anniversary! That's great commitment. +1 I'm a bit young for the whole MJ phenomenon (I remember him mostly as the guy who was into 13 year-old boys), but I do remember the first time I saw the 'Thriller' video on MTV or VH1. It was spooky and cool and I didn't understand it, but I've since grown to love it. You have to, right? It's like a law of the universe. +1 I'm adding this contest to the sidebar of my blog at: http://ceceliabedelia.blogspot.com. I really love Vera Bradley bags. I've been looking for one that'll fit my MacBook...the bowler might do the trick. Thanks for holding the giveaway! i LOVE Vera Bradley... so kind of you to offer this up. At my wedding 10 years ago out of the blue I hear Thriller being played. I went a little nuts trying to figure out who requested it. It was my aunt who wanted her daughters to hear the song. At my wedding????? and i love this bag... vera bradley is ALWALYS so cute!!! 4)my favorite michael jackson memory is my whole swim team performing the thriller tour during a swim meet that we decided to be 80's themed... it was a BLAST!!! This is one of my favorite style Vera bags and I'd love to win it! Thanks for the giveaway!! Love me some Vera B! Hope I win! I was in High School when Thriller came out and I'll never forget all the kids dancing to it over at "Our Place" in Marietta. Thanks for your blog, reminds me of home and makes me feel young again when I read it! 4. Favorite MJ memory would be that I was terrified of the Thriller video as a kid and my older brother would try to torture me by making me watch it. I'm a Vera lover! Great giveaway! My best MJ memory was when Thriller came out. We all crowded around my 13" tv and were scared silly. Then we immediately tried to learn the dance. We taped that on our...are you ready....on our BETA!!! Yes, for all you youngin's who barely remember VHS, there was also BETA which was very short lived.. and this was pre-remote control....whew, do I feel old. But we did learn the steps and danced our hearts out. Well I'm posting here since I just found your site and am a new follower to both sites.